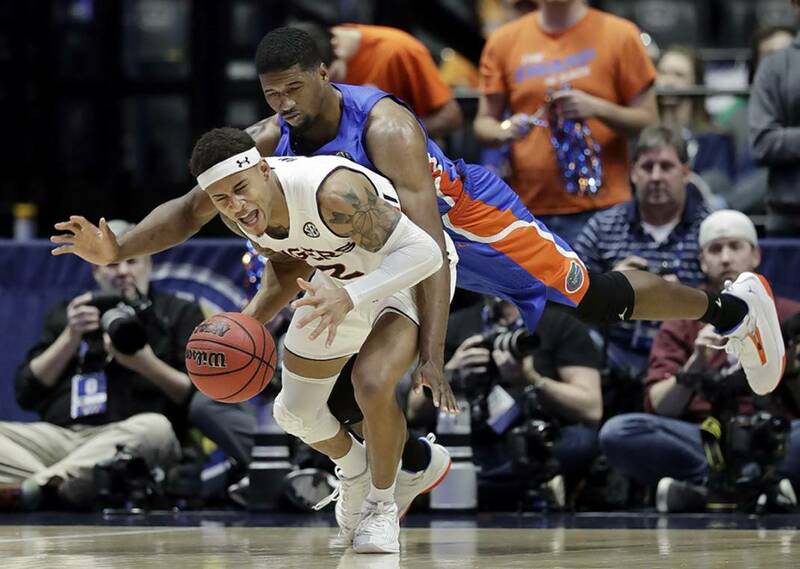 Auburn guard Bryce Brown, front, is fouled by Florida center Kevarrius Hayes during the second half of their SEC men's basketball tournament semifinal Saturday in Nashville. Auburn won 65-62. 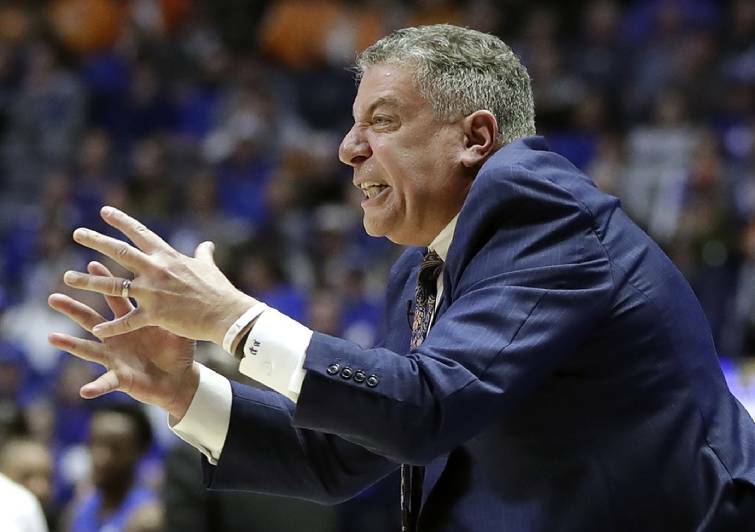 Auburn men's basketball coach Bruce Pearl reacts to an official's call in the second half of the Tigers' SEC tournament semifinal against Florida on Saturday in Nashville. NASHVILLE — Auburn is stringing together some impressive accomplishments on the basketball court with coach Bruce Pearl. Now the Tigers have a chance at something particularly special before the NCAA tournament begins this week. Jared Harper hit a 3-pointer with 12 seconds left as No. 22 Auburn held off Florida 65-62 Saturday to reach the Southeastern Conference tournament title game for the first time since 2000. Auburn (25-9) came to Bridgestone Arena as the league's No. 5 seed after sharing the SEC regular-season title with Tennessee a year ago, and in Sunday's 1 p.m. EDT title game, the Tigers will take on the eighth-ranked, third-seeded Volunteers, who beat fourth-ranked, second-seeded Kentucky 82-78 in Saturday's second semifinal. Auburn is looking for its second SEC tournament championship, with the first coming in 1985, and the title game also gives the program a chance to boost its NCAA tournament seeding. The 68-team field will be announced Sunday after the completion of conference tournaments. Florida (19-15) cruised past Arkansas in the second-round and knocked off regular-season champion LSU in the quarterfinals, but it might have taken one more upset to assure the Gators — who have lost four of their past six games — of a spot in the NCAA bracket. "We're just trying to stay hopeful," Florida senior Kevarrius Hayes said. "It's up to the selection committee and what they decide." This game felt much more like a consolation prize and warmup contest compared to the other semifinal, with some of the biggest cheers coming on a reminder that Kentucky-Tennessee was up next. Auburn and Florida did their best to put on a good show with lots of shooting, and the Gators put on a clinic in precision to keep pace with the Tigers' offense. The Gators turned in their best shooting performance of the season (60.5 percent) on their fewest shots of the season (38), and they also dominated on the glass, getting 32 rebounds to Auburn's 17. "It's really hard to look at that stat sheet and explain an Auburn victory," said Pearl, who took over at Auburn in 2014 and coached Tennessee from 2005 to 2011 before being fired in the wake of NCAA violations and later being given a show-cause penalty that kept him out of coaching for three years. Auburn's fourth and final turnover came with 57 seconds left when Chuma Okeke was too slow getting the ball across midcourt. Keyontae Johnson missed for Florida, and Harper answered with a 3 — his lone basket of the second half. Jalen Hudson drove for a layup with 7.4 seconds to go, then Harper hit one of two free throws with 6.2 seconds left. Johnson rebounded the missed free throw, then got the ball to Hudson, who passed to Andrew Nembhard, whose 3-pointer with a second left was the winner against LSU. Auburn watched the end of that game. That's why three of its players surrounded Nembhard, and his shot came up well short and drew no foul call before the buzzer. Harper finished with 20 points, with 17 of those coming in the first half. Bryce Brown scored all 11 of his in the second half. Hayes and Hudson each had 16 points to lead Florida, which was ahead 34-30 at halftime. The Gators had a season-high 19 turnovers, and Auburn converted them into 20 points. "It was the turnovers," White said, "that ultimately cost us."